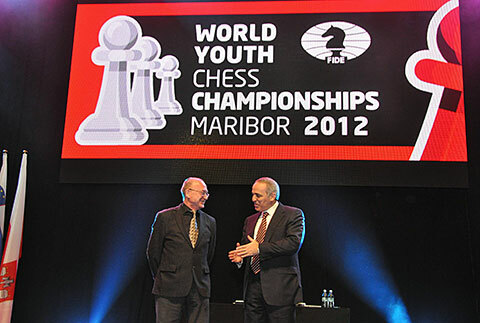 11/21/2012 – 1584 players came from 92 countries for 11 rounds of non-stop action, and at the end no fewer than 12 new world champions were crowned. 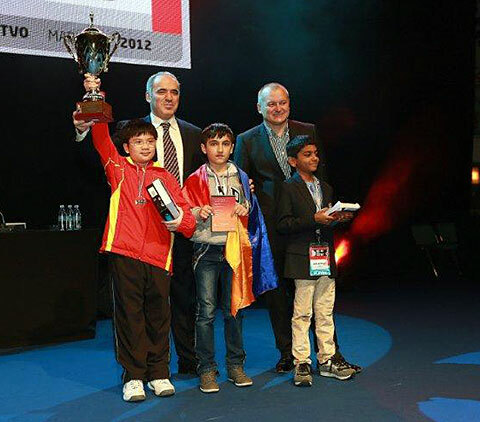 It was fitting that for their first title as world champion, none other than Garry Kasparov, full of praise for the event, came to give the prizes. Many special winners were crowned from a 14-year-old winning the U18, to the one player to score a perfect 100%. 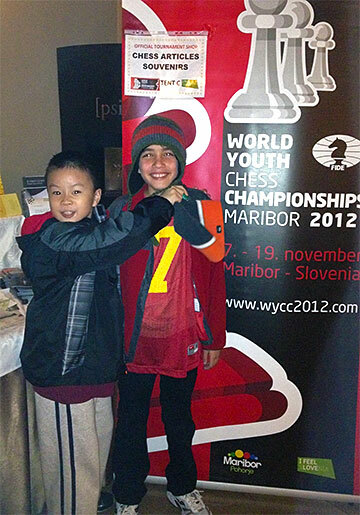 The 2012 World Youth Chess Championship, which was held in Maribor, Slovenia has ended. 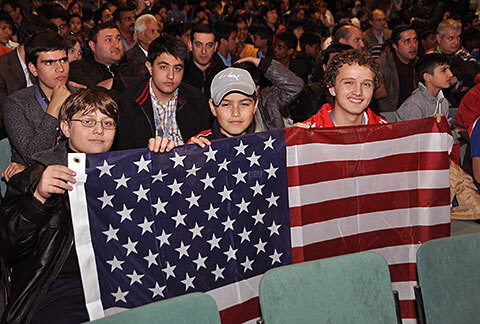 During this period no fewer than 1584 players from 92 different countries played an incredible 8712 games. The event was a huge test for the organizers who managed to pull off a highly successful event in spite of the various challenges. 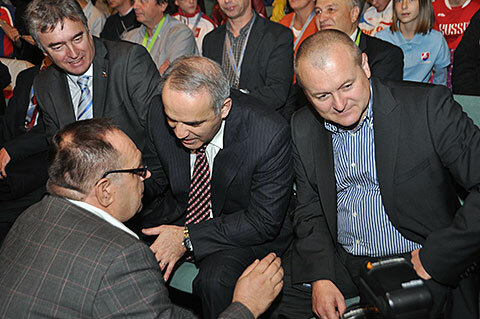 Dr. Milan Zver (left) and Maribor mayor Franc Kangler (right) listen in. For one thing, Maribor is a small city and it had never before hosted such a large event, furthermore the organization chose a very ambitious technological setup, which included live video feeds, as well as live transmissions on 90 electronic boards. The only event with this many boards has been the Olympiads, and it showed just how much they invested in it, as they managed to pull it off with no breakdowns in any of the rounds. 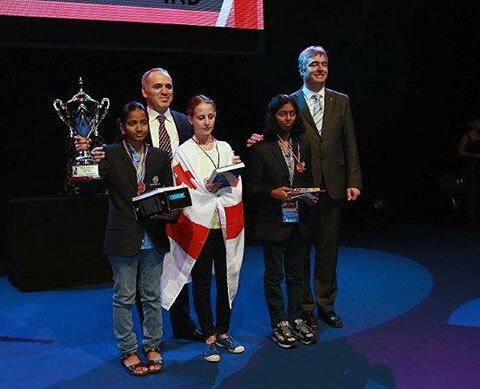 It was a privilege and pleasure for ChessBase to be a part of this event and contribute to making it one that the children are unlikely to forget, as it becomes the standard for future editions to beat. they all received, though not necessarily the same edition. 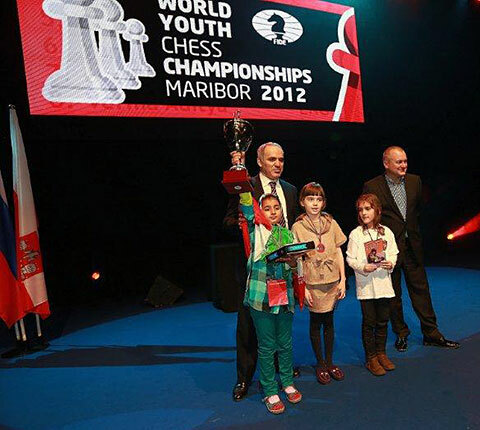 The highlight of the WYCC 2012 was without a doubt the visit of Garry Kasparov at the closing ceremony, where he personally gave away the prizes to the top three players in each category. 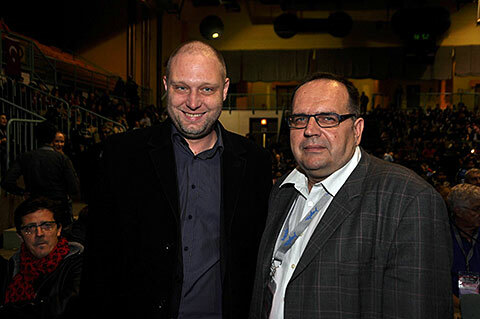 He complimented the organizers and city of Maribor effusively for the exemplary organization. 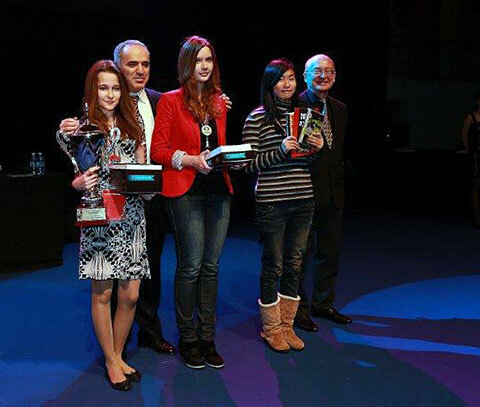 During his stay in Maribor, Kasparov will also open a Chess Academy, which will be named after him. 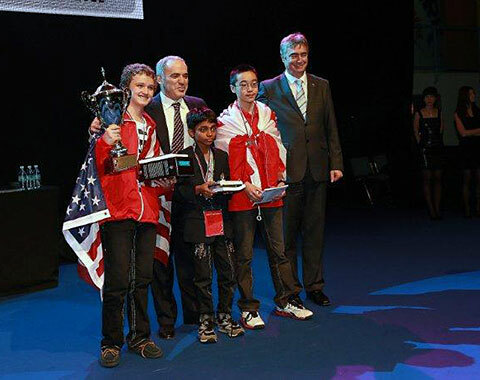 After eleven rounds of hard competition twelve new World Youth champions were crowned. The most successful countries of the championships were India and Russia, each with eight medals (four golds for Russia and three for India). The third most successful was the USA with four medals. In the category U18 open GM Swiercz Dariusz from Poland, confirmed his top-seed status as he took the gold with 9.0/11. The silver went to GM Gabuzyan Hovhannes from Armenia and the bronze to Peruvian GM Cori Jorge who clinched his spot with a crucial last-round win. 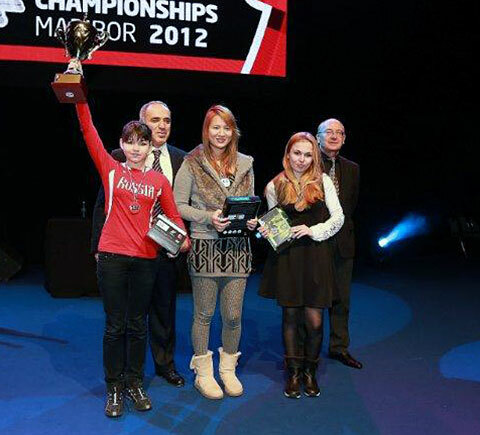 A wonder girl from Russia, 14-year-old WGM Aleksandra Goryachkina swept the competition in the Girls U18 as she took gold a full point ahead of silver medallist, WIM Lisa Schut from Netherlands. Bronze went to untitled Maria Severina from Russia. Russian IM Urii Eliseev from Russia won the gold medal in the Open U16 after leading it from beginning to end. 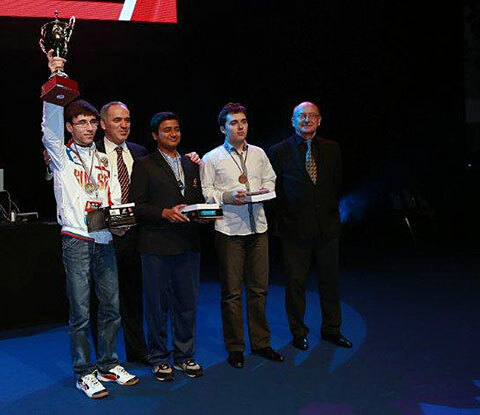 In second and silver was Indian FM A. Girish and in third was IM Maxim Chigaev from Russia. The top two places in the Girls U16 also went to Russia. WFM Anna Styazkhina took the gold while silver went to her compatriot Polina Rodionova. Xiao Yiyi from China, who had lead throughout the entire championship, ended in the third place after she lost in the last two rounds, precisely to the two Russians who leap-frogged her. In the category U14 open FM Kayden Troff won the gold after staging a fantastic comeback in which he spent much of the event ranked tenth or so, until the final round, where a full point behind the sole leader FM Aravindh Chithambaram Vr. from India, he beat him and secured gold on tiebreak. The Indian came in second and took silver. Canadian IM Richard Wang won the bronze medal. 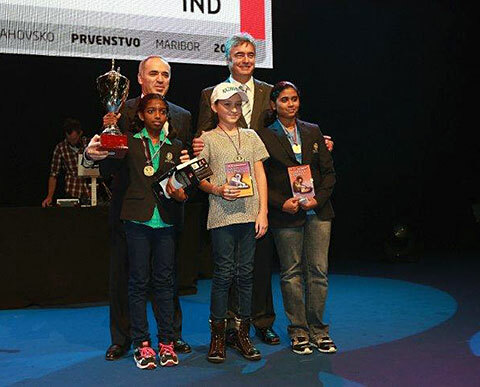 In the Girls U14, the gold medalist WFM Mahalakshmi from India also ended strong with three wins in the final rounds. Nino Khomeriki from Georgia won the silver medal and the bronze medal went to Indian WFM Monnisha Gk. 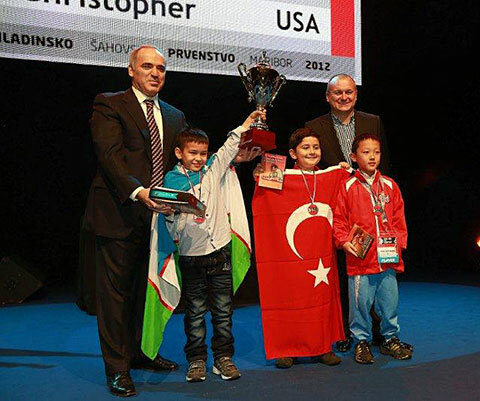 In the category U12 open the huge favourite Samuel Sevian from the USA, rated 2347 FIDE, ultimately won the gold medal after a few unexpected stumbles along the way. However it was his ability to come back with key wins over his main rivals that secured him the top spot. The silver went to American Cameron Wheeler, who had taken the lead in the last rounds, but lost it to Sevian in round ten, and the bronze went to Chinese FM Zhu Yi from China. FM Kayden Troff (gold U14). In the Girls U12 R. Vaishali R from India took the gold after a key win over leader and top-seed WIM Abdumalik Zhansaya from Kazakhstan in round eight. 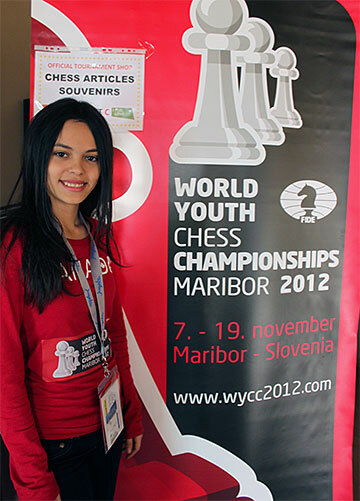 The Kazakhi took silver, while WCM Savant Riya from India was bronze. The category U10 open was particularly special as FM Nguyen Anh Khoi from Vietnam not only won the gold despite being ranked 13th in the starting line, but did so with a perfect 11.0/11 the only perfect score by any of the competitors. Note that he was also the U8 Asian champion, which is where he earned his FM title, and is clearly a force to reckon with. 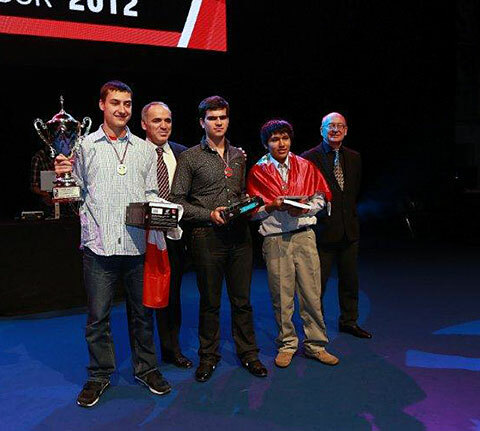 Two points behind, winning silver, was CM Shan Sargsyan from Armenia, while bronze went to the Indian FM Aravind L N Ram. In the Girls U10, the Indian N. Priyanka had also been heading toward a perfect score with 9.0/9 but finally drew in round ten. He lead was so large though, that in spite of a loss in the last round, she took clear first. Silver went to Olga Badelka from Belarus and bronze went to Russian Alexandra Maltsevskaya. In the Open U8 section Nodirbek Abdusattorov (Uzbekistan) won the gold medal in the category U8 open. 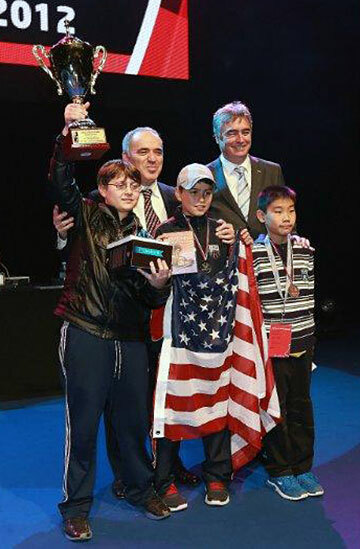 The silver medal went to Uzumcu Ahmet Utku (Turkey) and the bronze medalist was Christopher Shen (USA). In the category girls U8 Motahara Asadi (Iran) won the gold medal. Taisiya Tereshechkina (Russia) won the second place and Juhasz Judit (Hungary) won the bronze medal. Kele Perkins, the father of Joaquin Perkins, one of the US participants in the Open U8 section sent an account of his son’s tournament and comeback from a disastrous 103rd place after five rounds, to a tie for 4th-10th at the tournament’s end. My son Joaquin came into the event hoping for a medal and expecting a definite plus-score of some kind. After 3 losses (all with White) in the first 5 rounds, the disappointment really set in: a medal was very likely out of reach. He had to reset his goals -- perhaps a top ten finish was still possible. But I realized that our pseudo-focus on the final goal rather than on immediate goals (seeing threats, calculating variations, et cetera) was getting in the way of just playing chess. I realized that he could not play (optimally) one tournament at a time, or even one game at a time; he needed to focus on one position at a time. With this in mind, I switched to having Joaquin focus on these short-term micro-goals. I myself find this difficult to do, but Joaquin managed to do it with minimal guidance. His results turned around dramatically – an easy win against Bird's Opening, a quick demolition in a French sideline, and he was now winning as White! Relatively quickly, it became apparent that Joaquin was doing a better job at managing the many micro-tasks involved in conducting a successful chess game. Though his games were far from perfect, his newfound focus on the present moment's demands, and not on the long-term concerns, was reflected in his play. 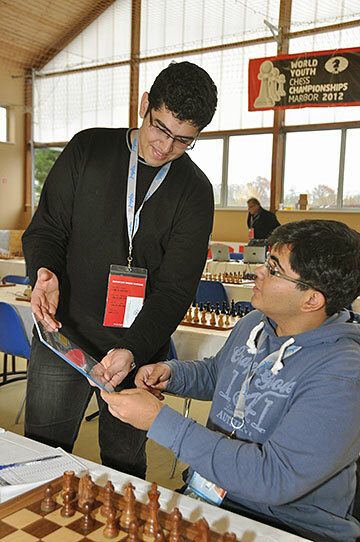 In his last-round game against a young champion from India, Joaquin had to fight back from a worse endgame position to seal his sixth consecutive victory in the tournament. He had gone from 103rd place after 5 rounds to tied for 4th (10th on tiebreaks) at the finish! We also received the following pictures and words by Canadian player Ashley Tapp. 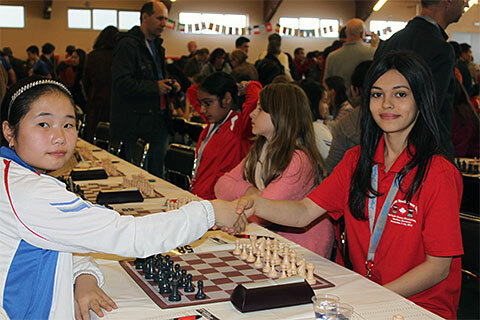 I had the best time of my life, and I thank Maribor and Slovenia for supporting my journey to my first International Chess Tournament, and for sharing news about chess in Canada.